Space Coast North; Covering Ponce Inlet area of New Symrna southward to Playalinda Beach, Canaveral National Seashore. Sandy bottomed surf zone with a sandy trough that forms just beyond the shorebreak with a sandbar just offshore of that. Space Coast Central; Covering Port Canaveral area southward to Indian Harbour Beach. Starts as a sand bottom from Port Canaveral southward, transitions to a coquina reef formation at Patrick Air Force Base southward through Indian Harbour Beach. 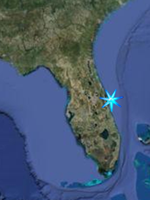 Space Coast South; Covering Indialantic Boardwalk area south to Sebastian Inlet. At Indialantic Boardwalk the bottom has once again reverted to a sand bottom with a trough forming just offshore. Tends to get deeper closer to shore than areas farther North.